Help End World Poverty...simply by downloading this Ebook. What have you got to lose Its free today for Kindle readers Three minutes of your time to help change the world. 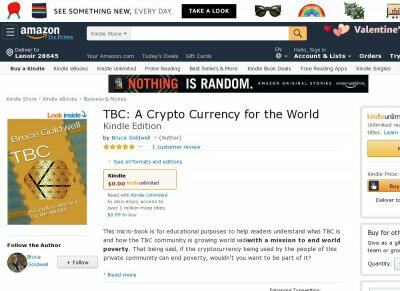 This micro-book is for educational purposes to help readers understand what TBC is and how the TBC community is growing world wide with a mission to end world poverty. With over 3,000,000 already in the TBC community, members continue to share this peer to peer crypto currency with others. Soon the TBC community will experience hyper-accelerated growth. After reading this book, the author hopes to have provided enough information to help readers decide whether or not to join the world wide community of TBC. Kringles are the smallest unit of TBC The Billion Coin Kringle coins are PRIVATE SMART PHONE CURRENCY ready for Merchants to use and accept. Merchants and Consumers alike love the speed and convenience of using Kringles to conduct transactions that are recorded on a blockchain for security. Kringle coins are currently in the hands of millions of people worldwide and we have an aggressive distribution plan to enroll one billion members into our private community by 2020.